The lieutenancy areas of Scotland (Scots: Lieutenancy auries o Scotland) are the areas used for the ceremonial lord-lieutenants, the monarch's representatives, in Scotland. The lord-lieutenants' titles chosen by the monarch and her legal advisers are mainly based on placenames of the traditional counties of Scotland. In 1794 permanent lieutenancies were established by Royal Warrant. By the Militia Act 1797 (37 Geo.3, C.103), the lieutenants appointed "for the Counties, Stewartries, Cities, and Places" were given powers to raise and command County Militia Units. While in their lieutenancies, lord lieutenants are among the few individuals in Scotland officially permitted to fly a banner of the Royal Arms of Scotland, the "Lion Rampant" as it is more commonly known. Lieutenancy areas are different from the current local government council areas and their committee areas. 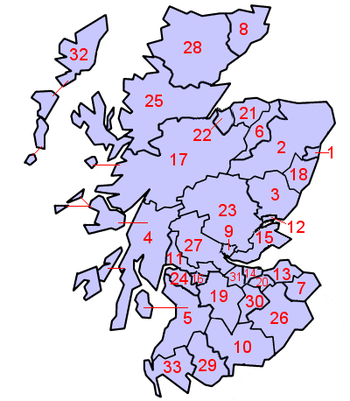 They also differ from other subdivisions of Scotland including sheriffdoms and former regions and districts. The Lord Provosts of Aberdeen, Dundee, Edinburgh, and Glasgow also act ex officio as lord-lieutenants. This is a unique right in the United Kingdom: all other lord-lieutenants are appointed by the monarch, rather than being elected politicians. Each Lord-Lieutenant of a county holding office immediately prior to local government reorganisation on May 16, 1975 was appointed to an area (usually the traditional county area) within the regions and districts which were established on that date. The regions and districts were themselves superseded in 1995, but the lieutenancy areas remain the same. The Lord-Lieutenants Order 1975, Statutory Instrument 1975 No. 428. The Lord-Lieutenants (Scotland) Order 1996, Statutory Instrument 1996 No. 731 (S.83).